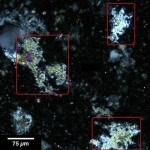 This examination identifies the rocks and minerals present in coarse and fine aggregates. At least 150 particles are identified for each sieve size in a gradation. 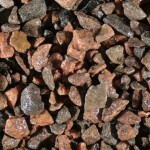 This test is essential for understanding the aggregates that are used to produce concrete and can be the only method capable of detecting components that may have adverse reactions from alkali-aggregate reactions, freeze-thaw damage, or other mechanisms such as popouts and sulfuric acid attack associated with iron sulfides. Click here to see the standard. This test is the most widely accepted method for determining the air content and parameters of the air-void system in hardened concrete. The test provides key information on not only how much air is present, but whether the size and spacing of the voids are suitable for providing protection against freeze-thaw damage. At DRP we measure paste and aggregate content in addition to air content, which allows us to trouble-shoot concrete mixtures for strength issues as well as freeze-thaw durability issues. Click here to see the standard. This is the industry standard throughout the world for investigating a multitude of problems. The scope of the standard lists more than twenty different purposes for the examination. 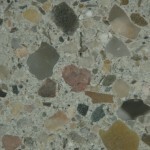 In brief, these may include determining whether the concrete complies with mix design submittal information and job specifications, trouble-shooting strength issues and determining if aspects of workmanship such as consolidation, finishing, and curing, are adequate. 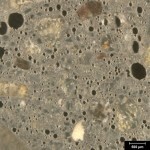 Petrography is also the only accepted method to determine if concrete is undergoing progressive deterioration from mechanisms such as alkali-silica reaction, sulfate attack, chemical attack, corrosion, early freezing, freeze-thaw damage, and more. Click here to see the standard. This test involves a combination of petrographic analysis per ASTM C856 and additional chemical analysis. This combination of techniques affords an opportunity to determine the composition of the type of mortar (M, N, S and O) as described in ASTM C270, Specification for Mortar for Unit Masonry. The test method is also used for understanding mortar compositions in historical structures where preservation and restoration are the priority. Click here to see the standard. Higher magnification. Superior resolution. In situ chemical analysis. 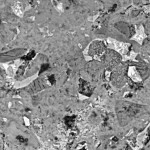 These attributes make the scanning electron microscope (SEM) equipped with an energy-dispersive x-ray spectrometer (EDS) an ideal instrument for supplementing nearly all of the investigations described in the scope of ASTM C856. We house a state-of-the-art FEI Quanta 250 Environmental SEM configured with an EDAX Apollo silicon drift detector EDS. Click here to see the standard.